In the taut thriller The Shallows, directed by Jaume Collet-Serra when Nancy (Blake Lively) is surfing on a secluded beach, she finds herself on the feeding ground of a great white shark. It will require all of Nancy's ingenuity, resourcefulness, and fortitude. 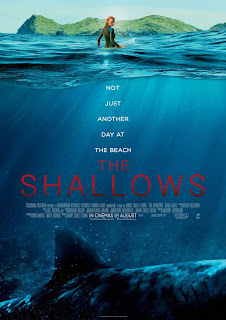 To enter simply email to this address: darrensworldofentertainment@gmail.com and in the subject line put SHALLOWS. Competition closes August 18th and is exclusive to New Zealand only!